Halloween, Christmas, New Year’s Eve…. No-one celebrates the holidays quite like Mickey, Minnie and pals! Make sure you book your tickets for the magical seasonal events happening throughout the year at Disneyland Paris. 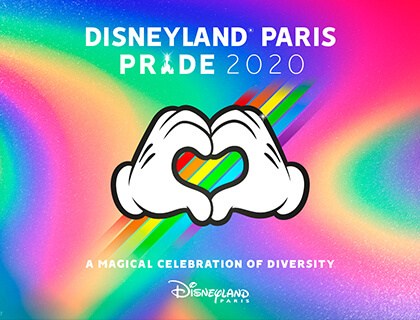 Live your best life, and shine with the joy of diversity at Magical Pride, a dazzling party lighting up Disneyland® Paris 1 June 2019. Electroland is back for 3 nights! Walt Disney Studios Park will be transformed into an electro club night of epic proportions, with exclusive sets from world-famous DJs! Dancefloor legends including Steve Aoki, Alesso and Jax Jones will take to the decks on the outdoor stage of Production Courtyard, while a spectacular light show illuminates The Twilight Zone Tower Of Terror. The park’s most popular rides and attractions will be open until late into the night, so party-goers can experience Disneyland Paris in a way they never have before! For one night only, Disneyland Paris welcomes a host of internationally renowned artists for an evening of jazz styles & rhythms with a distinctly Disney twist! Select attractions at Walt Disney Studios Park will be open especially for the event, with Meet ‘n Greets with some of the jazziest Disney Characters! Book the Premium Ticket for the once-in-a-lifetime chance to experience internationally-renowned artists perform live on the stage of Motors ... Actions! Stunt Show Spectacular. On select nights in early November, the night sky over Lake Disney explodes with flashes of fireworks and stunning special effects, the excitement builds with a rousing soundtrack and Mickey himself makes a special guest appearance to celebrate Bonfire Night! Disneyland® Paris also reserves the right to inspect visually or with specific equipment guests’ clothes, coats and personal belongings at the entrance of the Disney® Parks, and in their enclosures for security reasons including costumes covering the entire body. Visitors wishing to wear a costume of their favourite Disney Character must not pose or sign autographs. Same price applies for all guests, adults and children over the age of three. Free for children under age 3. To access the evening festivities, a special bracelet will be given to valid ticket-holders upon arrival at the Park entrance. For safety reasons, Disneyland Paris also reserve the right to visually inspect or use security scanning equipment on your clothing, coats and personal belongings before entry and/ or inside the Parks especially for guests wearing multi layered costumes that cover the entire body. Guests who would like to wear a Disney Character costume commit to refrain from posing for photos and from signing autographs. Proper dress is required at all times, top and bottom garments, as well as footwear, are to be worn. Animals are not allowed at Electroland, with the exception of assistance animals. Guests are subject to search upon entry. ElectroLand reserves the right to refuse access to any person whose behavior poses a threat to the safety of other visitors or themselves. Disneyland Paris Events 2019 is rated 4.6 out of 5 by 1596.